Very well done. Nice suspense and good ending. Great Character sketches. I really enjoyed the audio book. I loved loved loved this book. I was totally transported into Theo's world. What a read! And the narrator was amazing. Her ability to show, not tell, is remarkable. Brilliant work. I liked the narrator except I think a female should have been used for the female voices. All the female voices sounded like they were being read by a transvestite. The story? Engaging. The writing? Sub-par. I desperately wanted to find out what happened to Theo, but felt like I was reading a children’s book. Adult content aside, I would have been more impressed if I were a middle schooler when I read it. Entertaining? Yes. Literature? No. Not sure how this won the Pulitzer. Loved the book and thought the narrator was excellent! Was fully transported into Theo’s world. I love the narrator and his portrayal of the characters with accents. Detail was great and was able to visualize the setting. The characters were well developed and kept me in suspense. 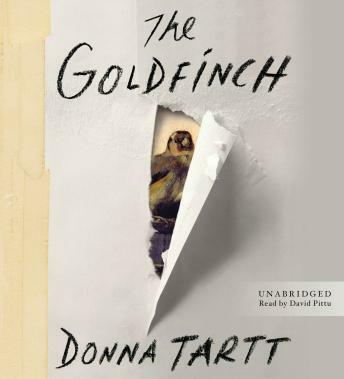 I really liked the book, but I couldn't finish the audiobook because of the narrator. He was tolerable when he was reading Theo, but all of the other characters were butchered ... especially the women! What was the narrator thinking? ?